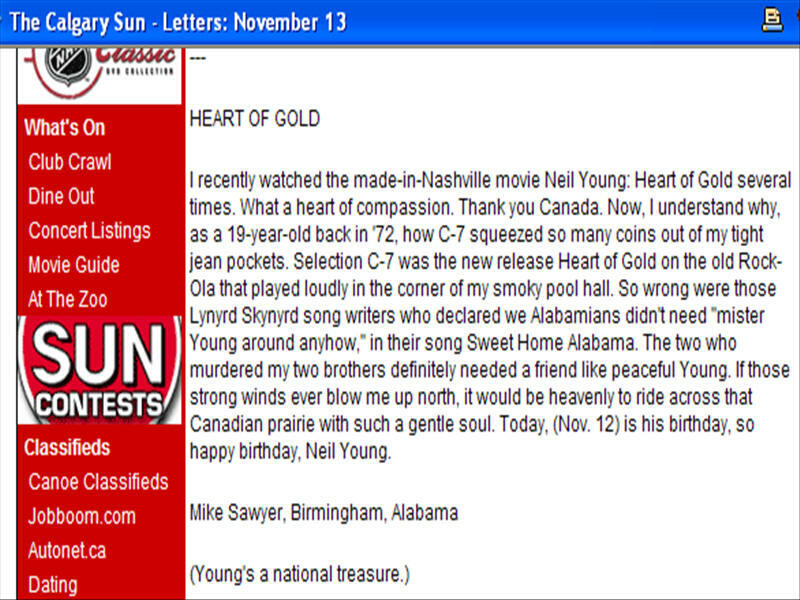 I recently watched the made-in-Nashville movie Neil Young: Heart of Gold several times. What a heart of compassion. Thank you Canada. Now, I understand why, as a 19-year-old back in '72, how C-7 squeezed so many coins out of my tight jean pockets. Selection C-7 was the new release Heart of Gold on the old Rock-Ola that played loudly in the corner of my smoky pool hall. So wrong were those Lynyrd Skynyrd song writers who declared we Alabamians didn't need "mister Young around anyhow," in their song Sweet Home Alabama. The two who murdered my two brothers definitely needed a friend like peaceful Young. If those strong winds ever blow me up north, it would be heavenly to ride across that Canadian prairie with such a gentle soul. Today, (Nov. 12) is his birthday, so happy birthday, Neil Young.